In this 90 minute live webinar, Astrologer Coach Sonja Francis will review current significant astrological events and guide you in interpreting how they can personally impact your life. Sonja only does 12 live webinars a year. This is a very easy and inexpensive way to discover the deeper meanings of significant current astrological events and find out how to use this information to attune with universal energies, accelerate your path, gain insight into issues you are dealing with and make positive change toward living your best and highest life right now. Other than booking a reading with Sonja, this is the highest level of support she offers. Remember, this webinar is interactive — you’ll be able to ask Sonja questions and use your birth chart actively. Attendees will be guided in seeing how the upcoming energies impact us each personally by looking at where the energy patterns land in the birth chart. Sign up to join the webinar live or register to receive an mp4 video presentation within 24 hours of the live event. Live attendance is not required, though always preferable. This product includes an MP4/video presentation of the most current webinar. If you’re interested in aligning yourself with the upcoming energies, this is for you! 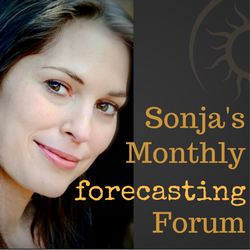 Sonja highly recommends you watch her “How to Read Your Birth chart” class before attending her Monthly Forecasting Forum.